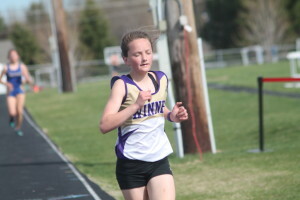 Sidda Schuyler set a new school record in the two mile at the Pierre Legion Relays on Friday. The runner ran the two mile in a record setting time of 11:50.93. Chloe Bartels held the old record of 12:02.30 set in 2013. The girls 4×800 relay prequalified for the state track meet in 9:57.86. Runners were Chloe Bartels, Saige Schuyler, Samantha Schuyler and Sidda Schuyler. They took third place at the Pierre meet. For the Winner boys, Cameron Kuil won the 100, 200 and 400. The next meet for Winner will be April 27 when they travel to Lyman. On May 2, Winner will compete meet in Burke.